We announced the 2015 Campaign results on Friday January 29 announcing a total of $1,900,001…so far! We are truly grateful for the extraordinary effort of our donors and volunteers to date and over the next few weeks we will still be taking donations to close the gap and get to goal. More than ever, we need your help. More than ever, your donation will significantly impact those in need in our community. Without the anticipated United Way commitment, many agencies will struggle to deliver the much needed programs that offer support to so many. This truly is an urgent situation. Please give today. CEO Jim Russell announces achievement of $1,900,001. “In September, we set a goal of $2,290,000 based on the need in the community. Without these crucial donations many individuals and families in our community are at risk of not getting the help they so desperately need in the coming year,” said Russell, “Today, we break bread in acknowledgment and recognition of the efforts of so many in the community. But our sense of accomplishment is tempered today…not our sense of gratitude. We are truly grateful for the extraordinary effort of hundreds of volunteers and thousands of donors to date but we know our work is not done yet. We will continue to petition the community to dig deeper. We recognize the competing demands in our community but we would not be meeting our obligations to our community or our funded agencies if we did not put out this urgent call to action,” Russell added. 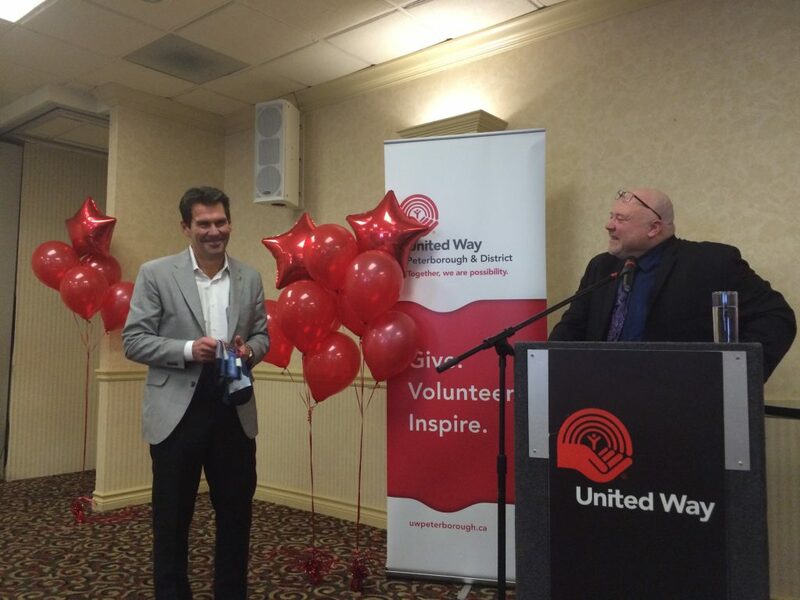 Russell was thoughtful in his delivery of the results stressing the importance of the work of United Way to the social fabric of our region noting the loss will be difficult to recoup without immediate action. In 1941, our United Way started as the Peterborough War Services and Community Fund, and was founded on a belief that it would restore to Peterborough’s heart and soul a sense of pride, hope and generosity. 75 years later, this still rings true. So too, the deep commitment of both business and labour to work together through United Way for the betterment of our community, the engagement of volunteers in every element of United Way’s work, a strong partnership with agencies and a deep commitment to stewarding donor investments wisely, all illustrate founding principles that have not changed. “If you have already made your gift, we extend our deepest gratitude. If you have not given yet, please give today and consider increasing your gift by even a few dollars this year. Every dollar makes a difference right here in the City and County of Peterborough and will help ensure thousands of local people will be able to get help at a time when they are most vulnerable,” says David Martin, 2015 Campaign Chair. “Historically, our community has rallied together when there is a problem. This is a real problem requiring immediate attention. These are real people who need your support; people who you may even know personally. Over a third of our population receives help from one or more of the programs funded through United Way,” added Martin.